The Russian Deputy Foreign Minister’s speech in South Korea is a clear illustration of Russia and China’s diplomatic methodology which contrasts diametrically with that of the US. Russia’s Deputy Foreign Minister Igor Morgulov has spoken at length about Russia’s peace plan for the Korean peninsula while at a meeting of the Valdai Discussion Club in South Korea. During his speech, he offered highly detailed and uncompromising views on why the joint China-Russian peace plan for the Korean peninsula, known as the ‘double-freeze’ is the only sensible way to restore calm to the region. Furthermore and most importantly, he outlined why Russia remains opposed to Washington’s punitive measures and bellicose stance against the DPRK. The genesis of Russia’s North Korea policy is best apprehended through an understanding of Russia’s diplomatic and economic goals for Asia and the so-called wider ‘Global South’. Russia’s manner of achieving things in the diplomatic arena, is linked indelibly with Russia’s wider geo-economic style of diplomacy. For Russia, peace and cooperation are achieved through initiatives involving economic inter-connectivity. By establishing joint-economic projects, in areas including energy cooperation and the establishing of new trading zones (free trade or with substantial reductions in traditional tariffs), Russia aims to ease geo-political pressure points through the incentive of prosperity that comes through countries having mutual shares in multilateral endeavours. One sees this in the Middle East where Russia continues to enhance cooperation with Syria, Iran, Iraq and Lebanon–all members of the geo-political northern bloc of the Middle East, while also maintaining good relations with Saudi Arabia, it’s rival Qatar and America’s traditional ally in Tel Aviv, while also re-starting intensified good relations with Egypt. In East Asia, Russia continues to expand relations with South Korea, in spite of Seoul’s ties to Washington. 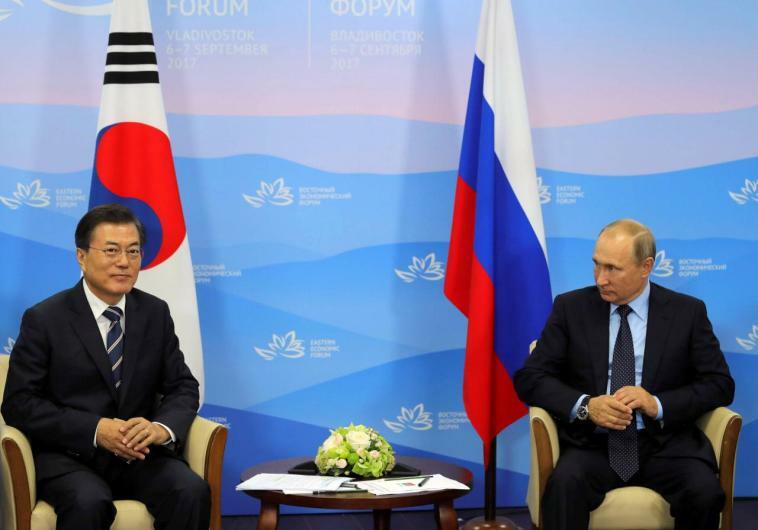 It is no coincidence that South Korea is increasingly responsive to Russian diplomatic measures at a time when trade between the two-countries looks set to rapidly expand. Implicit in the burgeoning relationship between Moscow and Seoul is the prospect for the tripartite economic cooperation initiative between Russia and the two Korean states, that was first proposed by Vladimir Putin at the Eastern Economic Forum held in Vladivostok shortly after this year’s BRICS summit. Both North and South Korean officials, including President Moon Jae-in attended the meeting. 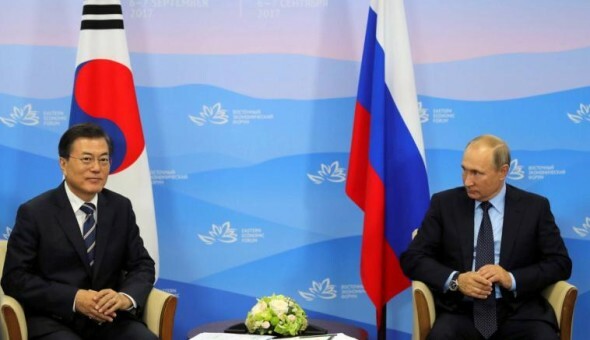 Officials from both Korean states were responsive to Putin’s proposals for joint economic initiatives, including the possibility of energy and logistical transport corridors that would link all thee countries. At the time and in subsequent statements, the North Korean government said that the only thing prohibiting Pyongyang from embracing the proposals immediately, was continued fears about threats to the DPRK’s security due to increased US military activities in South Korea. This is why the double-freeze is crucial for the success of such joint initiatives and it is why Russia is in close contact with South Korea regarding the matter. According to the double-freeze, North Korea must halt the testing of new weapons, while South Korea, the US and Japan must do the same, while also ceasing with provocative military exercises in the region. Russia is clearly attempting to convince South Korea to help and de-escalate joint US military activities in the region, something President Moon Jae-in has been receptive to in the past. In late October of this year, Seoul and Beijing reached an agreement whereby it would appear South Korea has agreed not to receive further US made and operated THAAD missile systems, a key demand from China. As a result, South Korea and China have quickly normalised economic and diplomatic activities, while the contents of the agreement have only been partly revealed. A similar agreement will need to be struck with Russia, entailing further commitments from Seoul to de-militarise certain aspects of US made armaments in the country, in order for Russia to feel confident in further leveraging the DPRK to reciprocate. Russia is perfectly clear about how seriously it takes the security concerns in both Korean states and it will certainly take intense negotiations with both sides to reach a point where the double-freeze can take shape. In many ways, China is now in closer communication with South Korea than with its historic Northern partner. While China remains fully committed to the double-freeze and to joint regional economic initiatives as part of the One Belt–One Road project, China’s relations with Pyongyang are at an all time low. Under Kim Jong-un, Pyongyang and Beijing have failed to see eye to eye on numerous occasions. However, Russia’s relationship with Pyongyang is, if anything, growing stronger and China is happy for Russia to take the diplomatic lead in this area. In this sense, one should not over-hype the strains between Beijing and Pyongyang as the US under Donald Trump is often inclined to do. In reality, as long as Russia continues in its diplomatic discussions with both Korean states and with China, all parties will eventually be satisfied, as each party will be able to air its concerns to a receptive diplomatic partner. Increasingly, these two elements of US foreign policy go hand-in-hand. One sees it in respect of the US arming India and siding with India in its disputes with both China and Pakistan. One sees it in the Middle East where the US continues to sell expensive weapons to Saudi Arabia while encouraging Riyadh’s anti-Iranian rhetoric. One sees it in South East Asia where the US is openly trying to stand in the way of would-be rapprochement between Vietnam and China and of course, one sees it in East Asia where Trump has touted weapons sales to Japan as a means of ‘containing’ North Korea. Far from de-escalating conflicts, the US model of geo-economics seeks to exploit conflicts for the sake of weapons sales. Nowhere is this more true than in respect of the Korean crisis, where one of the world’s longest standing frozen conflicts has heated up due to the US rhetoric against North Korea which seemed to spontaneously become highly aggressive starting in April of 2017. Russia has far fewer economic ties to the United States than China. Russia’s goal therefore is to use diplomatic skill to try and convince the US to be a less obstructionist power in the aforementioned conflicts. As this is likely to fail, Russia looks increasingly to built its economic relations with traditional US partners and in doing so, show the United States that the zero-sum mentality which is implicit in its foreign policy, is not economically prudent and mutually beneficial in the long term. This strategy involves helping traditional US partners, who often act as though fully dependant on the US, to achieve and more independent and consequently balanced foreign policy, thus giving these states their own form of leverage to use against the authoritarian style of US foreign policy. Russia’s relationship with South Korea is a demonstrative of such a policy. With this context in mind, the following are the key highlights from Igor Morgulov’s speech in South Korea. “Unfortunately, I have to say that the apocalyptic version of developments in this region exists and I very much hope that there will be enough common sense among the regional community to prevent this negative scenario from happening…. …The gas project is at the most advanced stage of the implementation, but the political situation unveiling on the [Korean] Peninsula does not let [us] bring the project into life. We hope that the political conditions for the implementation of this project, which is beneficial for all three sides, will emerge in the foreseeable future”.